James Mason should know a good quality football pitch when he sees one. Up until a year ago, he was working as a football reporter on BBC’s Final Score, covering Premier League games on the carpets of Old Trafford and Stamford Bridge. As I meet up with the club’s chief operating officer inside one of the Valley Parade executive boxes prior to Saturday’s friendly with Carlisle United, he is keen to show me the brand new playing surface on the pitch below us. 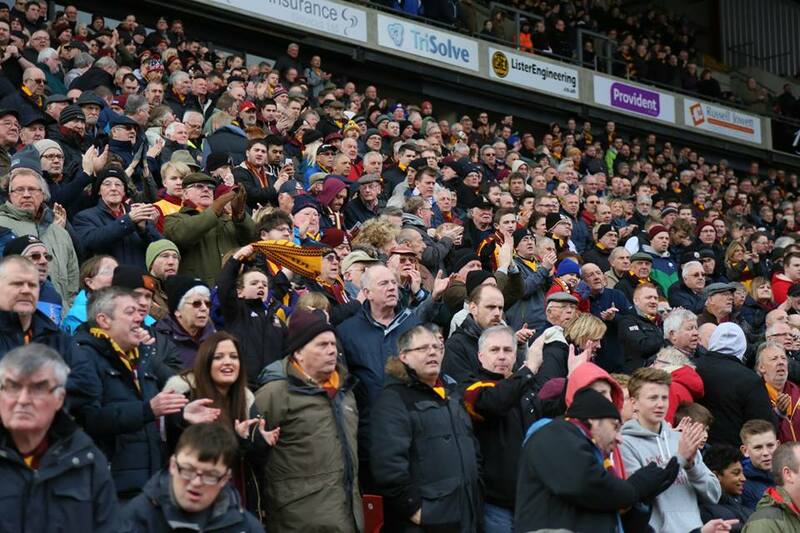 It is immaculate, it sparkles in the July sunshine – and it is one of many signs that Bradford City mean business both and off the pitch this coming season. Pitch-gate was one of several side-issues to the otherwise extraordinary 2014/15 campaign. The dreadful playing surface was the subject of blunt comments from Phil Parkinson towards board members, and was routinely ridiculed in the national media during City’s amazing cup adventure. 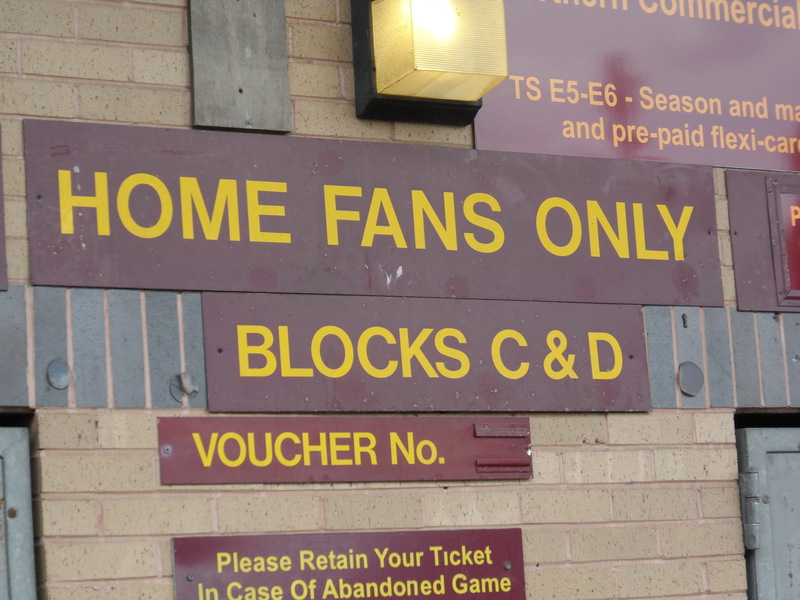 Significant money has gone into putting it right over the summer, just as my pre-match walk around the outside of Valley Parade offers clues that other parts of the stadium have benefited from some close season TLC. For now the pitch is a beacon to suggest past mistakes and areas of neglect are being addressed. 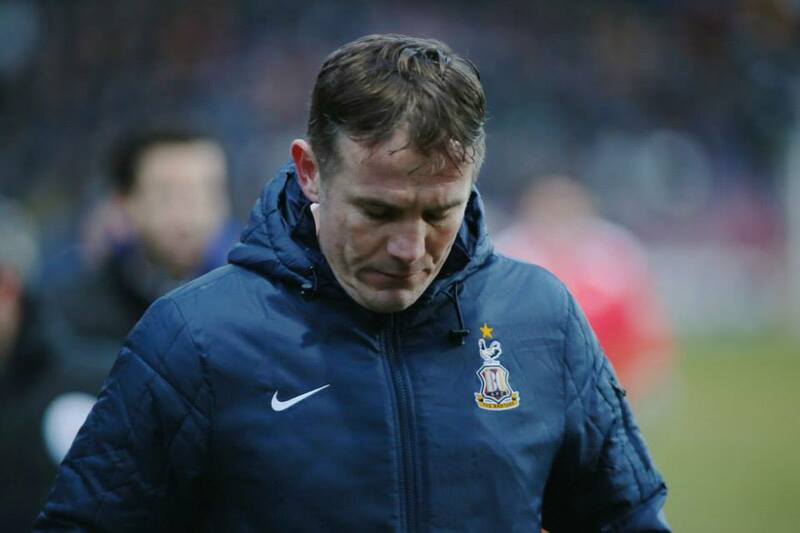 Since 2012, the amazing endevours of Phil Parkinson and his players have resulted in rapid progress up the football ladder, but at times last season there were suspicions that the non-playing side of things was struggling to keep up. Mason is confident that lessons have been learned and applied, as the club seeks to build on its growing profile, both at a local level and nationally. Mason’s journey into football and business was certainly an unconventional one, and yet he is a fantastic example to any young person of why you should always follow your passion. A football-lover from an early age, Mason always had a strong desire to become a sports journalist. “I’m a lifelong fan, as I think most people know, and I’m a very proud Bradfordian,” he explained. “I started watching in 85/86, along with my 20p bag of sports mixture, a bag of Seabrooks, and a can of pop! “I always wanted to be a sports journalist. I was never going to be a footballer, so I thought the next best thing would be to write about it or at least broadcast about it. Yet Mason’s worldwide travels caused him to delay studying for a formal journalism qualification, which inadvertently pushed him down the path of learning all about the world of business. He continued, “When I came back I had missed the boat at Leeds University to do a post-graduate course in Journalism. So I applied for next year’s, thankfully got a place on it, and then I spent a year in industry. And that year was valuable. “I worked out in Italy for a bit for a bespoke joinery firm and quickly advanced up the ranks with them, started working full time, and set up a UK subsidiary of their company. And at the same time I had now started the course at University, so I did both of them for a time. I studied all day, and worked in the evenings and weekends for this other firm. Having built up a positive relationship with the Bradford City board in recent times, Mason sensed an opportunity to combine his passion and skill set into another dream job – working for the club that he supports. Mason explained, “I knew David Baldwin was thinking of leaving Bradford City. I’d gotten to know Julian Rhodes and Mark Lawn and I came in for various interviews with David, Mark and Julian. So we hatched a plan that I could come in and take over David’s role. Those proposals were three-fold: exploiting the growing commercial opportunities of social media, targeting new and larger sponsors, and putting the club at the forefront of Bradford’s renaissance. “I think our social media was lacking,” he revealed. “We had around 30,000 followers on Twitter. 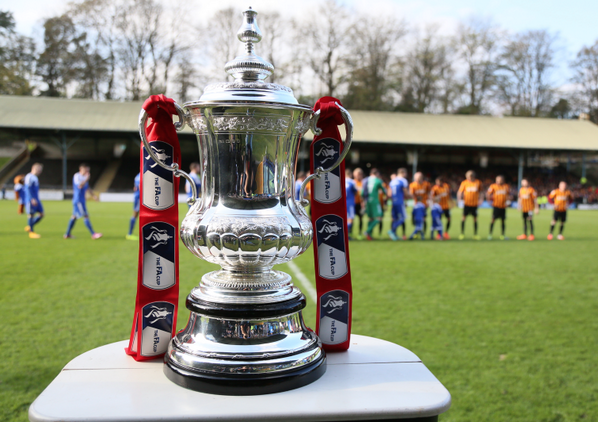 Clubs like Blackburn, Oldham and Blackpool – who are towns – were outstripping us. Going forward that’s going to be a huge revenue stream for us. It’s a key marketing tool. “Another key area is to use my commercial background to engage with sponsors, and re-engage with ones that we had lost. “And more importantly I saw my role as looking at the full picture. Bradford is about to go boom again. My first Bradford City shirt was the ‘Bradford’s bouncing back’ shirt, with the thumb-up logo on. It couldn’t be more apt if we had that on now. The Westfield Broadway is launching on 5 November. We are already in talks with them about doing things with them going forward. Such as how they can use our social media campaigns like ‘#onefournine’ to launch themselves. “We’re also trying to get some bigger players like Leeds/Bradford airport on board, and other bigger firms within West Yorkshire and further that we can use our profile to attract. Mason formally joined City in November last year just as David Baldwin moved to Turf Moor – and it’s certainly proven an eventful start. Most notably was the amazing FA Cup run that involved Millwall, Chelsea, Sunderland and Reading. Yet these special moments for supporters were soured for many by ticket fallouts, and Mason was made the scapegoat by many people. Comparisons were made between Baldwin and Mason that did not favour the latter. He admitted to me that it was a tough period. “Blending it all together it has been a hugely positive experience, even the negative and hard bits, which were obvious,” he said of last season. The first ticket controversy centred on the Chelsea game and the criteria that season ticket/flexi-card holders could jump the queue if they had a Millwall ticket stub too. The issue was complicated further by some season ticket/flexi card holders attending the cup replay and paying on the night, but they weren’t given a ticket stub to prove they were there. Mason recalled, “When we played Millwall and how we arranged the tickets, yes I was in the meetings but I wasn’t saying ‘this is how we’re going to do it, this is what we must do’. Far from it, because I’d not worked on it before. I’d worked in football all my life, I’d worked in business all my life, but not necessarily in football clubs. And no matter who you bring from any industry, football clubs are very different. “The way that Millwall was handled; firstly, all we wanted to do was to get the biggest crowd for the game to give us the biggest chance of playing Chelsea. Everyone was thinking about Chelsea, and probably thinking two or three steps ahead, without daring to think ‘if we do play Chelsea, what are we going to do?’ We got caught cold. “And it was a real eye-opening experience in terms of something that was a problem to overcome. In any other business, you do these things semi-privately. You make mistakes and get through them. Well at a football club, everyone wants to tell you what you did wrong and what you should have done. “The key was to listen and learn from that. Okay, we made a couple of decisions wrong later that came back to bite us. But what I was really proud of at the time was how we dug in and tried to get ourselves out of them. Another lesson learned from the ticket sagas is to actively listen to supporters more by seeking their opinions. I can personally vouch that this has started to happen, as Mason has contacted me for my views on certain matters over the summer, such as the away priority card scheme. Mason explained, “We all agreed that as we’ve all got Bradford City fans who are family members and friends, let’s go and ask them. We don’t have to do it on Twitter, let’s chat to as many people as possible. “I used people like yourself as a sounding board, I used David Baldwin as a sounding board, I used fans groups as a sounding board. From that, you get an idea what fans in the Midland Road are saying, what those at the top of the Kop saying. That’s invaluable. “There will never be just one ‘right way’ to do anything. All opinions will differ. Sometimes you have your own personal opinion as a fan, but as a Club official you have to do what is right for the longevity of the Club. 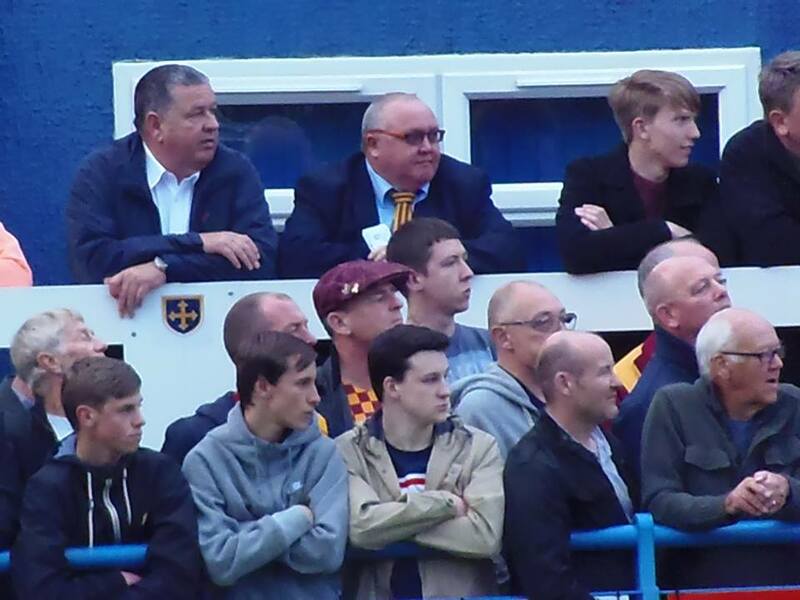 I am just a custodian holding the baton for future generations of Bantams fans. Our role is to make sure the Club is here for many years to come and in a better position than when we all joined. At the end of last season, Mason and the club staff also faced the uncertainty over the possibility that Gianni Paladini was going to buy Bradford City from Lawn and Rhodes – although ultimately the Italian didn’t have the finances to back up his interest. Mason reflected on the saga, “I wasn’t involved too much with things. At that level it is Julian and Mark’s business and their prerogative what they do with it. What I would say is it was an indication of the club being an attractive asset. “Gianni was a high profile individual who had tried to buy into a number of clubs. But it’s not unusual for us to be approached; and Julian and Mark have gone on record to some extent to say that if someone could come in with a lot more money than them and take the club to the next level, they’ve got to listen. “If you had read everything on social media and in the actual media, at some point it looked like the deal would definitely go ahead. But the crux of it was: money talks, and had the money been there, it may have been a difference scenario. Mason emphasised that fans should be confident that the two chairmen will always make decisions for the good of the club. “With Julian and Mark we have two people who have claret and amber running through their veins. They will only make a decision that won’t be motivated by anything other than being the right thing to do. At one stage when Paladini was in talks with the club, rumours circulated that he was planning to give Phil Parkinson a £10 million transfer budget. Even without this outside investment, the City manager was expected to have a healthy transfer kitty over the summer. Yet the departure of several high earners, and slowness to make signings, has raised concerns amongst some fans. The impression is that Parkinson has not being backed financially to the level that the FA Cup windfall suggested he would be. Mason argued that Parkinson has a healthy level of resources, “There’s still couple of weeks until the start of the season. The best things come to those who wait. “Phil has a wonderful scouting network looking at players up and down the country all the time. We’ve had bids in for senior players, significant players, marquee players throughout the summer. So it’s not that the investment hasn’t been there, Mark and Julian have backed Phil, and the three of them are astute in the transfer market. Phil and the club can attract players and I think Phil would say, and I would agree, that some of the signings he has made have been great. “Steven Davies was Derby’s top scorer in the Championship not so long ago. He has said ‘I want to sign a one-year deal because I want to be playing in the Championship, with Bradford City’. He’s a key signing in that respect. Josh Morris was one of the top scorers in a side that finished near us last season. He’s going to be a top player in years to come. The likes of Luke James and Mark Marshall are good signings too. Has the FA Cup windfall being fully given to Phil? Mason stated not all of it had, as there are other priorities off the field. “Yes we did generate a lot of revenue from the FA Cup, but our infrastructure means we’ve also got bigger bills than most clubs as well. On the same day we met, the T&A had announced City are holding talks with Parkinson and his coaching team over contract extensions. Mason is confident that new deals will be agreed, “Whenever I speak to Phil Parkinson I can’t help but be impressed by him. He has a real love for the club. He gets what it’s about, which I think is really important, and its history. He understands the social fabric of the city. I think he knows he is building a project – from what he inherited to where we are now. “On and off the field we are a different animal, and I think that’s much thanks to Julian, Mark and Phil working closely together. They’ve got a very good relationship. They’re very upfront with each other. Phil is very involved; he comes to the board meetings to explain things like players he is interested in and the progress of the academy. That’s invaluable. “We are all building something here. It would be great to get promoted this season. But if it doesn’t happen, so be it. But we came seventh last season, so it would be great to think we could finish at least one place higher and get into the play offs. The major success story of the summer is undoubtedly the record season ticket sales, which Mason has spearheaded through a series of clever and well-placed marketing campaigns. He is understandably very proud of the uptake, but can the club cope with the higher crowds on a regular basis? “We had a series of operational meetings to determine, if we hit our target of 15,000, can we cope?” stated Mason. “It is things like infrastructure in the ground and car parking outside. All areas of the ground will be open, for example. And the season ticket campaign itself? “We decided on £149 because it was a thank you to the fans who have got us to where we are, and I think that’s testament to who we are and how the club is run. It was a calculated risk and it’s paid off. “To get 18,000 is a phenomenal indication of what a fan base we have got. We’d proved during the FA Cup run that we had a bigger fan base; we just needed to make it affordable and accessible. I’d ask people to be patient going forward. We are growing Club and there will be growing pains. “I was really proud of the campaign and how we delivered it. It was delivered with very little financial input. We had the #onefournine hashtag and the drive through social media. We used Dynamo, one of our celebrity fans, and we made some noise in LS postcodes via the Yorkshire Evening Post website. We went to Horsforth and Yeadon Morrisons – not to sell season tickets, but to create a buzz. To get other people talking about what we were doing. 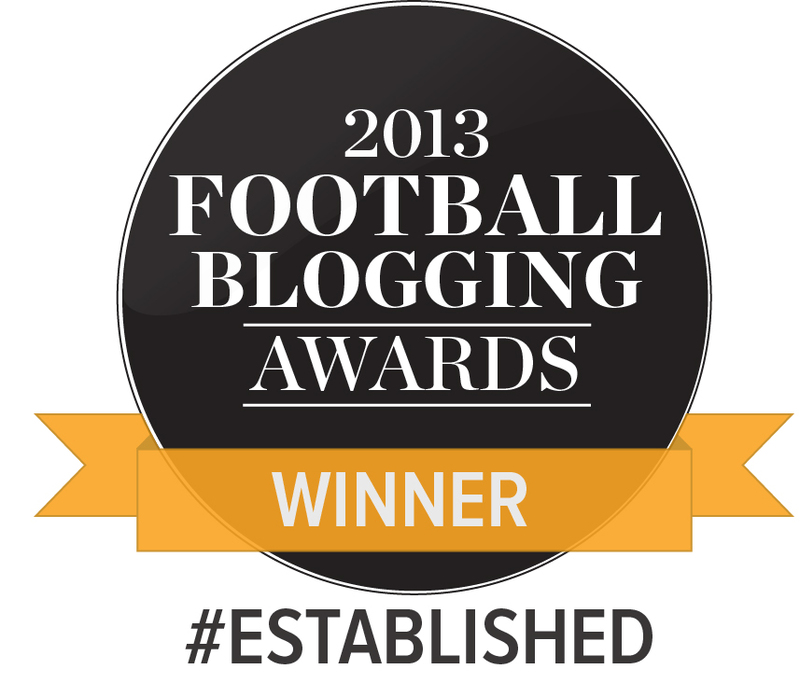 “For me it was about rolling everything up about being a Bradford City fan and that underdog spirit. Everything that it means to be a proud Bradfordian: Seabrook crisps, fish and chips, Tetley’s bitter, Bobby Campbell, Ces Podd, Admiral kits, Haigy’s (for a few), claret and amber – rolling it into one and saying ‘this is what I want other clubs to look at’. I want to get people saying ‘I wish my club was like that. I wish I was a Bradford City fan’. “The #bethedifference campaign was all about identity and galvanising City fans to understand that we can make a difference. The players are the key but the role we play as fans must not be underestimated. We are known up and down the country for our vocal and loyal support. “We’ve got Leeds United fans, Huddersfield Town fans, even Newcastle fans buying a season ticket. 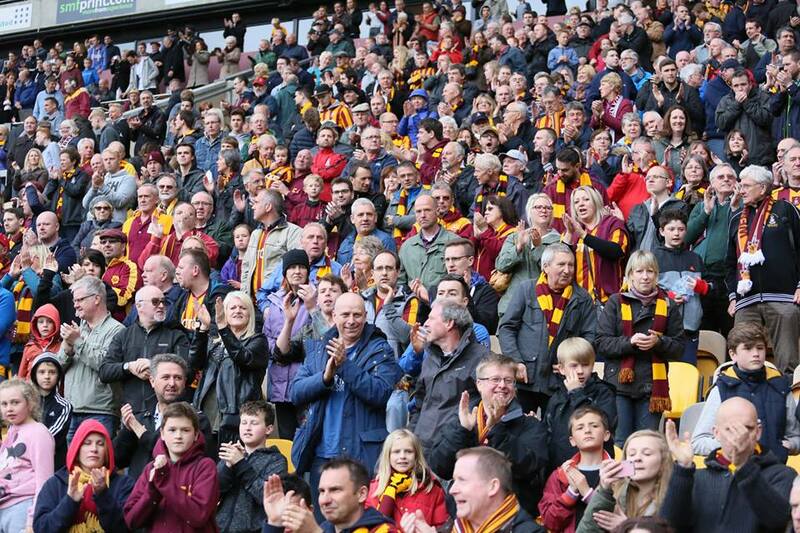 I’m not saying that we’re trying to get people to change their allegiance, but it’s about saying to people that your kid deserves the right to come down and see Bradford City, see the heroes that beat Chelsea. Superb article, detailed and fascinating. Thanks. Totally agree Dave and he comes across very well. What I dont agree with is that we are a massive draw for players as that has been proven by missing on lots of targets over the summer. It seems to me from the outside not knowing the full details but we are under paying on wages and hoping players will come because we have sold 18000 season tickets. Another superb article Jase, I always enjoy your interview pieces. I am an 80 year old fan and have met James Mason re a personal matter,and having had a successful life after starting at the very bottom and getting to the top, I can say that I was exceedingly impressed with him and i am sure he will continue to be a massive success at valley parade and he is also a lovely chap. Excellent article Jason. I really look forward to the updates to WOAP. Thanks for this. Nice to see a piece where the man himself comes across. Not a criticism of him, his job is to say the right thing so is bound to speak in soundbites to a certain degree. It’s worth remembering that James, like most other people who run the club is a City fan first and foremost. Personally I think that’s a really nice thing. No mention of Supporters Board? Thought one of their terms of reference would have been as a sounding board? I was very short on time with James and didn’t have time to ask him a question I had on it, but there are ‘rumours’ that all is not brilliant with supporters board and the club. If anyone knows better feel free to correct me. The Asians are more than welcome I am sure, can’t see what more the club could do for them, it would appear that they have other priorities on a Saturday afternoon..
“We had a series of operational meetings to determine, if we hit our target of 15,000, can we cope?” lets hope this means access to and from the kop have been improved then, it’s been uncomfortable (and at times felt unsafe) getting out of there since OIAM changed the thoroughfares.